A ferocious spider lives in the brain. His name is Willis! Note that he has a nose [pituitary gland], two suckers [mamillary bodies], eyes that look outward [internal carotid arteries], a crew cut [anterior communicating artery - blood flows in either direction], antennae [anterior cerebral arteries], a fuzzy beard [posterior communicating arteries - again, blood flows in either direction], 8 legs, a belly that, according to your point of view, is either thin (basilar artery) or fat (thepons, which lies from one end of the basilar artery to the other), two feelers on his rear legs [posterior inferior cerebellar arteries], and male genitalia [anterior spinal artery]. Willis has hairy armpits – the third cranial nerve exists between the posterior cerebral artery and the superior cerebellar artery [the first two sets of legs]. 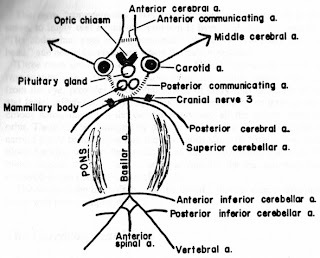 The cerebellar arteries were named by a real SAP (S – superior, A – anterior inferior, and P – posterior inferior) [SA - the last two sets of legs] and supply the cerebellum and brainstem. No Comment to " A Spider Called Willis "